FM19 Skin: TCS'19 v1.6 + WorkTheSpace Edition! The offical Football Manager 2019 skin, TCS returns after a year-long hiatus, and it's better than ever. Built for 1920x1080. With Instant Result Button. It's back! 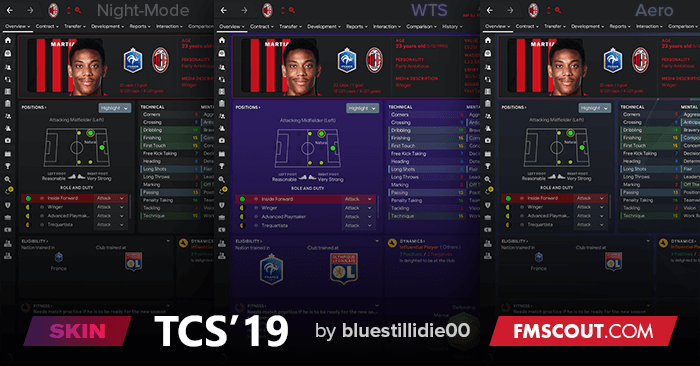 The beautiful, sleek TCS skin returns to FM19 and this time, it comes with a version designed by the biggest FM content creator, WorkTheSpace! I worked closely with Jack to help sculpt and design the special edition of TCS, which doubles down on the purple scheme introduced in the base skins, as well as incorporating the key features of TCS, including a brand new Player and Club Overview Screen and sleek, dark UI! The WTS also features minor tweaks to a few panels to help model the skin to Jack's ambition! Three versions! Regular 'Night Mode', an Aero version akin to previous FMs and a brand new WorkTheSpace designed edition! v1.1 in all essence is a massive bug bash, having not released a skin for a while I was bound to slip up and make a few mistakes, which i did, mainly leading to a poorer experience for players using the zoom function, hopefully that should be rectified with this new version. The main feature for v1.1 is the Aero skin has been completely overhauled, with new graphics for the entire skin being created and tweaked along with new graphics colours, the introduction of transparency (and reduction in some cases), to popups, and other panels should lead to a better user experience and offer a more consistent and higher quality skin. As well as this we've introduced a new background selector in the base + WorkTheSpace skin, along with a more advanced selector for the Aero skin, with big credits going to Bossland (YACS Skin) for letting me borrow code and concepts from his. v1.1 also sees the introduction of various panels for the selector panel. I won't be providing any support for this skin apart from major issues, don't request features as they will not be considered. ENSURE YOU EXTRACT THE BASE SKIN TO USE THE AERO/WTS VERSION. USAGE OF PANELS OR GRAPHICS FROM TCS '19 IS PROHIBITED WITHOUT WRITTEN CONSENT FROM ME. Discussion: FM19 Skin: TCS'19 v1.6 + WorkTheSpace Edition! 119 comments have been posted so far. amazing skin mate, hats off! defo the best in 19. @NathanNTFC Did you extract all three skins? Just downloaded this and have them in the skins folder and done what I should have. Yet in FM there's still only the default FM skins. I'm an iMac user. How can I get it to work?? Ta. Wow, this is the best skin in this FM!! Only one think, could you add the "Instant Result" please?? Its essential for me. AMAZING SKIN!! Congrats and thanks!! @bluestillidie00 - all fine and dandy, after I've removed the new news and social feed panels (no offence, wasn't working for me aesthetically), just the eligibility panel doesn't show the nation trained in (screenshot: https://i.imgur.com/RmXTVZ1.png ) Help? @Robbo - Emil, the author of Vitrex skins and hairstyle mods, retired in 2017 after a huge disappointment with the quality of regen faces in latest FMs. Using the WTS skin every time I change the panels on the player profile page and exit the player screen, when I open another player profile the panels are all reset back to the 'Plans' panel. Any ideas on how to fix this please? your skin is the best skin ever! nevertheless it stop working with the new update 19.3.2. is there any chance you fix it? thanks! Handcrafted in Symi, Hellas. Page created in 1.043 seconds.